You know it is always going to end like this. Well summer is well and truly here but you can’t be outside all the time and when you’re not what better way to spend the time than watching some maniacs play Happy Wheels. From the simple joy of blasting hapless Santa with a shotgun to hanging desperately to the controls of a Segway even when you are minus some legs…well who could resist a quick blast through some new levels. This week the top vids include the turn-down-your-volume Dashie, someone new to the top list in SkyVsgaming and one from Jelly and Daithi De Nogla. Not the greatest this week but we are sure be plenty out later this month. 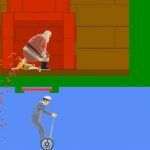 Of course if you are feeling a little more active then you can play Happy Wheels here, if not then check out the videos below.